This past month has been really busy. I have been reading a little, but I’ve gotten behind on reviews and will try to catch up now. I also spent a few days last week at Book Expo, which was great as always. I’ll post my book haul this week too. The Gunners by Rebecca Kauffman is about 6 childhood friends who grew up together in Lackawanna, NY. It has been 10 years since they graduated high school, and the friends are now only infrequently in touch. Mikey, the main character, is living a pretty quiet life in their hometown, where he is, sadly, slowly losing his eyesight. The only other member of the group still living in Lackawanna, Sally, had removed herself from the group back in high school, and he only sees her every now and again in passing. The group ends up reuniting when Sally commits suicide and they all come in for her funeral. Mikey and the four others end up spending the night at a lake house belonging to one of the others, and during the course of that evening, they learn things about the others that they hadn’t known when they were together. And while they each confess to feeling responsible for Sally’s estrangement from the group, they are in turn exonerated by the others, who are convinced of their own culpability. Secrets are finally revealed, ranging from sexual orientation, forbidden crushes and even paternity, bringing the remaining friends closer again and cementing their ongoing friendship. So, I liked The Gunners (named for the family who had previously owned the empty house where the group convenes), but I don’t think I loved it. It’s a melancholy little book, full of pain and sorrow for the main characters, but it’s ultimately a redemptive story about the power of friendship and connection. Whenever a new sorrow is revealed, it seems that the support and love of one of the others is there to help blunt the force of the blow. So while there is a lot of sadness, there is good too, as these friends bare their confessions and vulnerabilities on the road to acceptance. Rebecca Kauffman’s writing is quiet and understated writing. There were some standout scenes – in particular Mikey visiting his father at the meatpacking plant – and she has a nice eye for detail. All that said, The Gunners isn’t especially memorable and doesn’t all all that much to the canon of post-college friend reunion books. It was a good read but not amazing. This was our June book club pick and I’m eager to hear what others thought of it. If you’ve read it, please weigh in. Posted on June 10, 2018 by gayle. 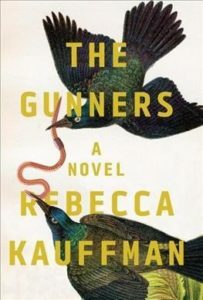 This entry was posted in Fiction and tagged rebecca kauffman, the gunners. Bookmark the permalink. I feel as though this is a modern “Big Chill” and while you and I may be the only ones who remember the movie…the plot is quite familiar. Still ISO my first read of 2019!!! Have you settled on a read yet?